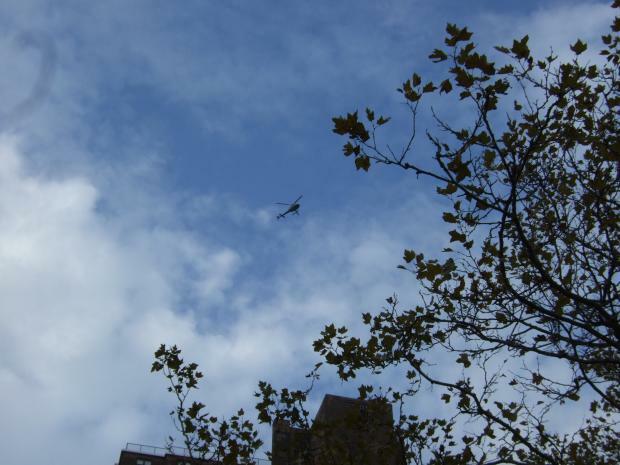 UPPER MANHATTAN — Uptown residents tired of the constant whirring sound of helicopters flying overheard are mounting a petition against what they say is an excessive flight pattern. Sightseeing helicopters flying over the historic 155th Street and Riverside Drive corridor have created such a disturbance — on a recent day one resident claims to have counted 67 flyovers in a three-hour period — that community members petitioned Councilman Robert Jackson this month, asking him to endorse a ban on the helicopters. “It is like we live in a war zone,” said Renée Davis who lives on the 11th floor of a building on Riverside Drive and West 156th Street. Davis said she was told by the New York City Economic Development Corporation, which oversees helicopter activity in the city, that the traffic was from tourism flights. Katherine Hannauer, a concert violinist who lives on 204th Street, west of Broadway, said she and her neighbors hear the helicopters at random times, more frequently in nice weather. Despite writing to the mayor’s office repeatedly, calling the city’s 311 hotline and contacting local representatives, Davis has seen no change in her Washington Heights neighborhood. She and the other petitioners hope the signatures will force some action and have asked Jackson to present their case to the community board. Jackson's representative, Sarah Morgridge, said the councilman is trying to get the issue on the agenda of a public safety meeting at Community Board 12. A press release issued by the Economic Development Corporation states that the current helicopter plan was established on April 30, 2010, in response to complaints from a group of politicians representing communities previously affected by the noise. The plan specified that tours from the Downtown Manhattan Heliport could not fly over Brooklyn Heights, Midtown and lower Manhattan. Instead, flights were directed north. According to Kyle Sklerov, a senior vice president in public affairs at the corporation, the heliport generates an estimated $45 million annually for the city’s economy. "We have worked very closely with helicopter operators and local communities to minimize the noise impact of tourist helicopters,” he said. “As managers of the heliport, we were able to come to two agreed upon flight paths. Prior to this agreement, tourist helicopters were able to fly over any part of the city." Kevin Ryan also lives on Riverside Drive in Washington Heights and collected signatures for the petition. He said the noise disrupts his family's life at home, forcing them to stop speaking to one another at the dinner table when the helicopters pass overhead. He said he thinks the city's decision to change the flight plan was unfair. In an email to Jackson’s office last week, he urged the councilman to advocate for the elimination of tourist helicopters altogether or to ask that the entire city share the burden of their disruption. “I think a case can be made that the decision transferred the nuisance from areas with predominantly wealthy, well educated, politically active Caucasian and Asian constituents, to one with low median-household income, comparatively little college education, and predominantly black and Hispanic constituents,” he said. According to 2010 census information, 74 percent of the population in Washington Heights is of Hispanic origin and 93 percent of housing units are renter occupied. Pamela Palanque-North, chairwoman of Community Board 12, is well aware of the issue and said she agrees with Ryan that the flight path should not have been moved north.